Fashion has been waffling between skinny and wide-leg pants for several seasons now, but based on the fall runways (and the editors attending the shows), skinny pants are here to stay--for now, at least. But considering skinny pants have been around for several years, it's puzzling that jackets have remained fitted and cropped--when put together, the look is both out-of-proportion and unflattering. Thankfully, several designers are starting to shift the silhouette with longer, stronger-shouldered jackets. Yes, they're kind of '80s (for a good laugh, Netflix Less Than Zero and marvel at how many trends are coming back into fashion). But try on a boyfriend jacket, and you'll instantly know that the designers were onto something back in the '80s: the shoulder pads make your waist look smaller, and the longer length skims your hips, disguising a multitude of flaws. 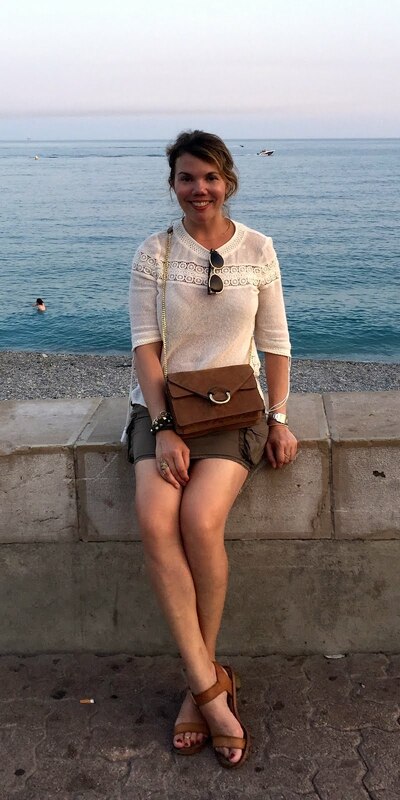 It's just that 20 years ago, it was too much of a good thing; these styles are much more streamlined and modern, and, yes, the proportion finally looks right with skinny pants. 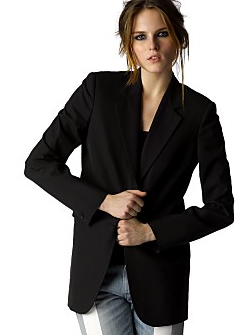 If you want to take "boyfriend blazer" most literally, this Maison Martin Margiela boyfriend blazer looks the most like something you've actually borrowed from your boyfriend. But the armholes are high and the shoulders are narrow (and lightly padded), meaning the fit will be much more flattering for your figure than actually borrowing your man's jacket. Stella McCartney may not get the editorial exposure that her label-mates Nicolas Ghesquiere or Alexander McQueen get, but she has built a solid business making exactly the kind of clothes women want to wear. 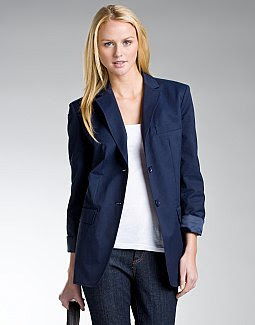 Take, for example, this silk shantung boyfriend blazer (it's almost sold out already on pre-order). I like how the notch in the lapel is lower than normal, and the shell-pink color is sure to flatter a range of skin tones. And then there's this Alexander Wang double-breasted jacket, which, at $625, almost seems like a bargain in comparison to the previous two looks. Wang is one of the leading proponents of the '80s revival, as well as being one of the hottest contemporary designers at the moment, so slipping into his blazer seems like the most logical way to get the trend exactly right. Acne Jeans is one of those labels that fashionistas go absolutely nuts over. I am starting to see why. This boyfriend jacket is quiet but cool, and I like that it's 100% wool (even the Margiela jacket above is a wool blend). If all this wool seems a bit heavy to you, then this Smythe boyfriend blazer will be a welcome alternative--it's linen, which means even when it's in the 80s outside, you can be comfortable in it. Also lightweight is this DKNY boyfriend jacket. DKNY's spring show was like a revived greatest-hits collection, and since the line got its start in the '80s, you know Donna Karan can do a mean boyfriend jacket. Added bonus: This style is now on sale! When it comes to budget options, this Pink Tartan blazer is not bad for $59. Sure, the tailoring isn't as sharp, but if you're unsure about the trend--or if you're on a super-tight budget--it's a low-risk purchase. I like this Trouvé jacket because it's knit, which makes it more like a sweatshirt, so it's more relaxed and it's not trying to be a sharply tailored style. It's like your weekend boyfriend blazer (and I bet it would be great for traveling). One of my favorites, however, is this Aqua boyfriend jacket. I feel like Aqua is Bloomingdale's best-kept secret--they do trendy pieces at good prices, and while some things suffer from polyester overload, this jacket is 100% cotton with a cute striped lining--at $88, a pretty good deal, all things considered. I just ordered mine today; fingers are crossed that it's a winner. In the budget category, Uniqlo also has a nice blazer right now, with a cut similar to the Acne one. It's polyester (or a blend?) but the tailoring is pretty sharp for $69.